On heritage day at the arts activity center 23-10-12 I looked at the Ariel photographs on display of Tilbury Docks and the surrounding area and I was surprised to see on display a shot of one of my first jobs I completed as an apprentice Plater for the Ayr Engineering Co later to become the London Graving Dock. The job was one of the stabilising arms that secured the jib of the steam crane on the jetty which was operated by Thames Welding for the parent company then, Ayr Engineering. There is a personal story for me concerning this photograph in that I had just been apprenticed to Ayr Engineering as an apprentice Plater in 1961 and the jib arm which seemed very large to me at the time was my first big job that I completed on my own. It’s construction was that of a channel iron top & bottom with angle iron cross struts and it was of an all riveted fabrication with a large solid block connector at each end which brought everything together to form one structure and the strength & elasticity was in the shape of the construction, the widest section in the middle of the structure tapering away at end to fit to the solid block connectors which were then fitted via these connection blocks to the main structure and the jib head. My part was to to remove & replace the angle iron cross struts which had rusted away and remove and replace the channel iron top & bottom structure again due to metal deterioration, then to reconstruct all back to original shape, and when the reconstruction was completed I was feeling pretty pleased with myself, but life has a way of bringing one back to earth, as I was about to discover. In these times we were all subsections of the Boilermakers Union ie; platers, welders, blacksmiths, shipwrights drillers etc, etc, and as such the lines of demarcation were set in stone thus I left the structure all bolted up temporarily for the boilermakers to rivet the structure to completion and there my problems began. They set up their forges heated up their rivets to white hot and then when they tried to push the rivets into the holes they could not push the hot rivets through the said holes although the bolts & rivets were of exact-ally the same dimensions I had not taken into account the expansion created when metal is heated up an therefore the hot rivets wouldn’t go through the same holes that cold steel bolts did so we had to call for the drillers had to ream out in position all the holes but as it was now a triple layer construction due to the construction the drillers billed the company at triple rate for every hole as believe it or not they were actually paid by the hole, a very expensive lesson for me at the time and although I rightly took a bit of flack at the time I was forgiven and wet on to work there until 1978. Also on display there was a rare photograph of both the Methane Princess& the Methane Progress together on adjacent jetty’s at Tilbury, I say rare as there was only two of theses ships running a shuttle service between Canvey Island & I think it was Tunisia although I am not absolutely sure it was Tunisia it was certainly around that area and it was very rare for them to be together as they would pass each other at sea but I do recall that at one time the London Graving Dock did actually dry dock both ships one after the other for maintenance reasons this probably accounts for it. 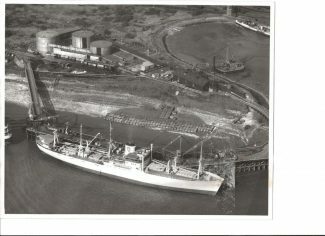 These ships carried liquid methane from the middle east to the methane terminal at Canvey Island and as London Graving Dock had the maintanence contract at the time we also did a lot of running repairs to the ships at their home depot at Canvey Island. These ships were of twin tank construction, there was an outer shell obviously and then an inner shell which formed that which is known as a viod space and inboard from the inner shell were aluminium cargo tanks which took the liquid methane, but due to the absolute extremes of cold required to keep the methane liquid and the movement of the ship at sea small fractures kept appearing in the inner shell, this was an ongoing problem that was never really solved despite the ongoing redesigning of the ships. For this reason we had on a frequent basis to go into the void spave to deal with these fractures which were labeled Cold-spots but as we were on a 50p per hour bonus in these when working in these viod spaces a fair sum back in the early seventies they were renamed by us as Gold spots. Hi John remember me Ernie Leahy.I served my time with Ayr Engineering and the last 18 months of my time was at Tilbury with you and Ricky Graham.The platers were Kenny Harvey ,Jimmy Ogearon and old Bill Winters and Alan Whitbread was the Forman.I remember my time there with great fondness I often wonder what happend to all the guys who worked there at the time any information on them would be fantastic. Very interesting reading your article Andy..I recall both the Methane ships very well. In fact I saw them both laid up in Cornwall of all places during the early 80’s, and took a photo being down there on holiday. Showed my family later, including the father in law, who,always fancied himself as something of a wit, when I told him the names, he casually asked, ‘Oh,and what did they carry? I just replied,’Princesses’! hi john, are you the john morris who lived in feenan highway.